“When something bad happens we have three choices: we let it define us, we let it destroy us, or we let it strengthen us." The tragic shootings here in Orlando have tested the strength and courage of its community. Yesterday as I watched the news coverage, all the while scouring the facebook safety check for friends, I felt at a loss on how to help. Even harder was how to explain this awful act of hatred to my 6 year old. Instead, my husband and I focused on showing our son all the people who were helping. Seeing the sheer number of people waiting in mile long lines to donate blood, delivering cases of water to the various blood banks, and participating in candlelight vigils, many of whom I call friends, proves that we are stronger than we know. 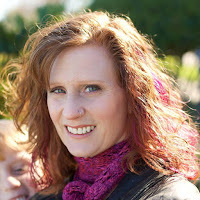 When it comes to community, the quilting community is one of the most caring and generous that I know which is why I'm asking for your help. We at the Orlando Modern Quilt Guild have heard from so many quilters asking how they can help so we're going to try and make enough quilts for the survivors and victims' families, and those directly affected by the shooting. If you want to help, please click on the graphic below for more information. Diana, thank you so much for sharing this information. My heart goes out to your community. Do you know if they are collecting blocks or would they like actual quilts? We feel the awfulness of the tragedy half a world away. I cannot imagine how it must feel for you and your friends in Orlando. I will send some blocks. Thank you for sharing this Diana: I wept when I was reading the Toronto Star report on this tragedy. Thanks for sharing a way I can lend support. what an unspeakable tragedy. 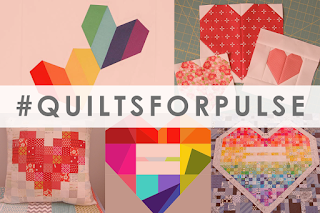 the Memphis Area MQG is already putting a plan into action to make quilts for this effort. 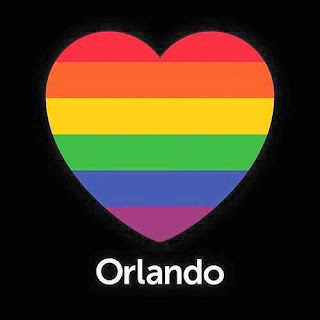 I am praying for the families of this horrible act of terror, and for the community of Orlando. Hate is an ugly, ugly word! Heavy hearts have been lifted by the unselfish acts of others. I've started making blocks and our Guild has a sew day this saturday. You can knock us down, but love will always win! Love is far stronger than hate, and I think showing your son all the love going around is a great idea. The haters will never win.